Lanzan campaña humanitaria dirigida a ayudar a víctimas en las zonas más afectadas por la erupción del Volcán de Fuego en los departamentos de Sacatepéquez, Escuintla y Chimaltenango a 50 kilómetros al oeste de la capital guatemalteca. Washington, DC (14 de junio de 2018) — La Fundación Panamericana para el Desarrollo (PADF, por sus siglas en inglés), el brazo humanitario de Organización de Estados Americanos (OEA), une fuerzas con el cantautor venezolano Ricardo Montaner, para responder con ayuda humanitaria a Guatemala tras la erupción del Volcán de Fuego. El volcán produjo una violenta erupción el pasado domingo 3 de junio, lanzando material volcánico a las aldeas más cercanas, causando la muerte de al menos 110 personas, y dejando a su paso 57 heridos, 197 desaparecidos, 3.652 albergados, 12.823 evacuados, y afectando a más de 1,7 millones de personas. El equipo local de PADF en Guatemala está trabajando con sus aliados locales para dar apoyo a las personas más afectadas. “Esta erupción ha sido la más violenta del volcán en Guatemala en un siglo. Nuestra prioridad es ayudar a los más vulnerables para minimizar el impacto humano, económico y social que este tipo de situaciones provoca en un país,” dijo Katie Taylor, Directora Ejecutiva de PADF. “Nuestra Fundación trabaja con organizaciones locales y grupos comunitarios para asegurar que su donativo llegue eficientemente a donde más se necesita,” recalcó Taylor. Las familias que han perdido sus hogares necesitarán apoyo de largo plazo para reconstruir sus viviendas, infraestructuras como escuelas, recuperar el acceso a los servicios y sus medios de vida, y restituir su estabilidad. Enfocados en estos esfuerzos de recuperación y reconstrucción, PADF coordinará con las comunidades y gobiernos locales, así como con los donantes internacionales para ayudar a las comunidades afectadas a recuperarse después de tan trágico incidente. A través de este esfuerzo apoyado por Ricardo Montaner, el cantante y compositor de reggaetón estadounidense Nicky Jam, el actor y modelo Argentino Horacio Pancheri, entre otras figuras públicas, PADF ha hecho una convocatoria internacional para recaudar un millón de dólares para cubrir las principales necesidades de los más necesitados en Guatemala. La Fundación Panamericana para el Desarrollo (PADF) es el brazo humanitario de la Organización de Estados Americanos (OEA). Establecida en 1962 por medio de un acuerdo especial por la OEA, PADF fomenta el progreso social, fortalece a las comunidades vulnerables, responde a los desastres de origen natural y las crisis humanitarias y promueve los derechos humanos y la democracia. Para más información, visite: www.padf.org. 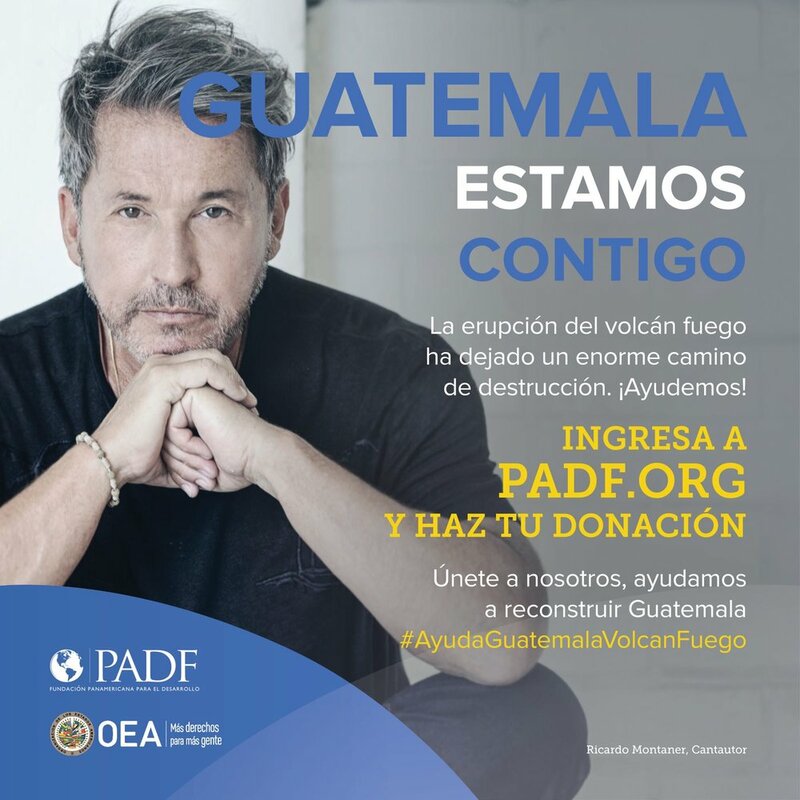 Washington, DC (June 5, 2018) – The Pan American Development Foundation (PADF) is accepting public donations to aid recovery and reconstruction efforts in Guatemala after the Fuego volcano eruption on June 3. The eruption has killed at least 70 people and forced over 3,200 more to evacuate their homes. Now, local residents do not know when they will be able to return home – or if their homes are still standing. Streams of pyroclastic flow destroyed buildings, property, and possessions. The Guatemalan National Disaster Response Agency (CONRED) estimates that over 1.7 million people have been affected by the eruption. The PADF team in Guatemala is assessing damages on the ground and preparing to assist those who were affected by the disaster. Families who have lost their homes will need long-term support to reconstruct buildings, regain access to services, and reestablish stable lives. Focusing on recovery and reconstruction efforts, PADF coordinates with local communities, local governments, and international donors to help affected communities recover. PADF has responded to many of the Western Hemisphere’s worst disasters since its founding in 1962. As the humanitarian arm of the Organization of American States (OAS), PADF activates post-disaster recovery efforts and simultaneously promotes disaster preparedness and resilience in vulnerable communities. The Pan American Development Foundation is a 501(c)(3) nonprofit organization that unites civil society, governments, and the private sector to promote sustainable livelihoods, strengthen democracy, promote justice and security, and improve disaster resilience in Latin America and the Caribbean. Established by the Organization of American States in 1962, PADF has worked in every country in the region. Last year, more than 10 million people benefited from PADF’s work in sustainable community development. For more information, visit www.padf.org. On September 7, a devastating magnitude 8.1 earthquake struck southern Mexico during the night. It was the most powerful Mexican earthquake in a century, and it killed more than 90 people in Juchitán and the surrounding area of Oaxaca and Chiapas. It also damaged vital infrastructure and various significant buildings, causing a state of emergency in the area. Powerful aftershocks were felt for days around the region. It also destroyed the region's main hospital and left families many doubting the structural integrity of their homes. Then, on September 19, a catastrophic magnitude 7.1 earthquake shook Mexico City and its surroundings, toppling dozens of buildings and severely damaging many more. Skyscrapers visibly rocked back and forth. Workers flooded the streets, hoping to get out before their workplaces crumbled. Nearly 300 people were killed in the incident, many trapped under rubble. Vital infrastructure and hundreds of community services like schools, shelters, roads and bridges suffered severe damage and urgently need to be rehabilitated. Both areas of the country need immediate assistance and emergency supplies. They also need long-term support to rebuild what they have lost to the misfortune of the disasters. PADF will assist the communities in greatest need, helping them to recover and rebuild their lives following the disaster. PADF is currently assessing the situation to intervene in the areas of greatest need, using its expertise in disaster response and coordination of resilient communities. You can help by making a monetary donation. To donate, please click the button below. Friends of Softtek can donate here. On September 5-6, Hurricane Irma wreaked havoc on the Caribbean island nation of Antigua and Barbuda before moving on to hit the Dominican Republic, Haiti, and the Bahamas. The record-breaking Category 5 hurricane was the strongest Atlantic hurricane on record, and it rendered thousands homeless. Just a couple weeks after Hurricane Irma caused so much damage in the Leeward Islands, Hurricane Maria quickly strengthened into a Category 5 hurricane before smashing the island nation of Dominica with 160 mph winds and heavy rain. Several mudslides occurred as the hurricane destroyed 90% of buildings on the island, littering it with structural debris. The hurricane also pummeled straight into Puerto Rico, which caused extensive damage and knocked out its electrical grid. Now, 3.4 million residents could be facing a humanitarian crisis as officials say power could be off for moths. A major dam's structural integrity was compromised, and now it's threatening to collapse. The hurricanes have caused damage of historic proportions. For the first time in 300 years, the entire island of Barbuda (of the nation of Antigua and Barbuda) is uninhabited, as its 1,800 now homeless residents fled to Antigua. Irma's 185 mph winds knocked out 95% of its infrastructure. In Dominica, 98% of all buildings have suffered damage, and many are beyond repair. In Puerto Rico, 3.4 million residents are still struggling to access electricity and water after its grid collapsed. The gravity of the devastation calls for an immediate and long-term response to rebuild what was destroyed by the hurricanes. PADF will work alongside local organizations to rebuild more resilient communities that are capable of withstanding and responding to future extreme weather events. Since first responding to disasters 55 years ago, we have developed a strong network of partners in the Caribbean that work with local communities to recover from disastrous events. Now, you can be part of the disaster response. Monetary donations help alleviate immediate disaster-related needs, like locally-purchased water, food and supplies. Please donate to be a vital part of the Caribbean's effort to recover from these catastrophic storms.